Often the landscape and figurative paintings that draw the most interest from the public (and attention from judges in shows) depart from the “blue sky with clouds” format that many less experienced painters seem drawn to. Imagine night scenes in the city, or deep fog and mist over a countryside, falling snow, or reflections in puddles on rainy country roads. These settings immediately set your painting apart and convey a special sense of time and place through atmosphere. Trouble is, atmospheric effects are very hard to paint, especially in acrylic because the illusion depends on rendering soft, indistinct shapes with blurred outlines and muted colors - in short, a sense of mystery. And those subtle effects are very challenging to paint realistically. To compound the problem, we tend to shoot most of our photos on sunny days. So it's often necessary to use a sunny-day photo and "invent" atmospheric effects to add interest and mood to our painting. This workshop provides lots of ideas and special techniques for doing just that. Watercolor and acrylic paints have a number of attributes, such as the color intensity (chroma), transparency, and whether the type of pigment lies on the surface, or sinks in and stains the paper or canvas fibers. Problem is these attributes can vary greatly from color to color and from brand to brand. A tube of " Raw Sienna", made by one company, may be quite a different color from that made by another manufacturer. Many aspiring artists struggle with color mixing because they're unsure about the exact hues and attributes of the paints in their art box. Not knowing that and what to expect when they mix one of these colors with another makes painting a frustrating trial and error process. In this workshop we discuss characteristics of the most common pigments. And we work through a number of color assessment and color mixing exercises, using the paints each participant currently is carrying in his or her paint box. Participants will gain a better understanding of how the pigments they prefer using perform individually and in mixtures. Even more experienced painters find this workshop fun and enlightening. When painting realistically from life or from photos, we soon realize the world is full of objects that are neither very interesting looking, nor attractive from an artistic perspective. So our first task is to avoid painting those objects "as is" into our paintings. No matter how beautifully we paint an uninteresting, unartistic object, sadly, it doesn't become any more acceptable. Over the centuries, fine artists have learned to "redesign" nature in order to create paintings that transcend the ordinary. They readily alter the shapes of trees and rocks, the path of streams, the shapes of mountain ridges on the horizon, clouds, buildings, etc. They also carefully orchestrate the balance of lilghts versus darks, warm versus cool colors, and flowing versus angular shapes to give each painting a definite personality and increased visual coherence. Often even the spaces between objects in the landscape ("negative shapes") must be redesigned to better lead the eye through a painting, or to solve problems of compositional balance. In the same vein, artists must often invent new, more harmonious color palettes rather than slavishly rendering the scene in front of them. This truly creative process is fundamental to producing wonderful, inspiring images of the "real world". And it is an essential skill that all serious artists must sooner or later develop. This workshop helps begin that process. In this first session, we'll study how light models the various planes that make up the structure of a typical head. To simplify the learning and painting process, well use only black and white pigments. We'll concentrate on identifying, mixing and applying the precise values of light and dark needed to produce the appearance of a truly three-dimensional head seen in typical Rembrandt-style side lighting. This introductory workshop is perfect for beginners, and also for more experienced painters who feel they may lack some of the basic information and skills needed for realistic flower painting. We'll start at the very beginning, studying the effects of natural light falling across individual flower petals, stems, and leaves, and how to render those effects in paint. .
Then we'll create a painting of some very simple, single flower varieties (buttercups, crocus etc.) We’ll use a limited palette to simplify the painting process, and focus on getting the shapes, shading, values and perspective just right. No vases or fancy flower arrangements in this introductory workshop. We'll tackle more complex subjects in Flowers - Part 2. Many find it challenging enough simply to draw the physical structure of a rose blossom. But we painters must also confront a wide range of color and light- to- dark value transitions. Think of a Peace Rose - the beautifully subtle colors shifting from yellow to peach to scarlet. Now, imagine having also to show effects such as how the natural colors of each petal shift toward the cool light of a blue sky. Then, as shadows fall across each petal, how reflected light from other petals and nearby green foliage further modifies the petals’ natural color. Finally, we must ensure our final image feels as soft as rose petals feel against your skin. The wonderful news is that once you l learn to paint a single rose, you'll have mastered many of the skills needed to tackle the very similar challenges of rendering flesh tones in a portrait. The addition of small figures of people can add a lot to a landscape painting. The trick is to create the impression of one or more characters with just a few brush strokes. This is not going to be a serious session on capturing all the anatomical details of the human figure. Instead, in this fun workshop we'll learn to paint little figures of lumpy, dumpy folks with lots of personality, using a minimum of brush strokes. Then we'll learn how to place them in the distance in simple landscapes, in proper perspective, so they appear to belong there. No stick figures here, and no complex figure drawing skills needed - just ordinary folks, in small groups, going about their business. Guaranteed to make you and others smile when they see them pop up in your paintings. If you'd like to start painting in a more free, stylized, or semi-abstract style, this workshop is for you. We study a variety of approaches to creating a more personal interpretation of a still life or landscape and work through a number of exercises designed to explore the possibilities. You will definitely leave this workshop feeling much more comfortable moving beyond tightly controlled realistic renderings to producing paintings that feel fresher and more creative. Ever wondered why nearby things always look bigger than distant things even when you KNOW they’re not? Or why train track rails seem to narrow in the distance, when you know that's impossible? The problem is that the lenses in our eyes and cameras distort the appearance of the real world. Ever painted or photographed a landscape that turned out great, except for the odd looking barn? Painting trees and mountains is easy. The trouble starts when we try to put a structure or a person in the scene. Then our inexperience as artists comes shining through. Our barns look tilted, or appear to float above the ground, and our people seem out of scale with the world. It’s often because we mistakenly copied a photo which itself had distorted perspective because it was shot from the wrong angle or with the wrong lens from the wrong distance. So here's your chance to learn how to avoid using bad photos as painting reference, how to take better ones yourself, and how to ensure your paintings more accurately portray the real world. Although you'll get a chance to try out a variety of brushes and paints and materials during this class, this is not a typical hands-on workshop. Instead, we'll look at a wide range of typical easels, paints, brushes, painting surfaces, and accessories and discuss their pros and cons for watercolor, acrylic and oil painting. Troy will also offer examples of his own paintings done with the specific gear and materials under discussion. Calm lakes and gently flowing streams are wonderful subjects for landscape artists, but are also among the most frustrating to paint realistically. Often we can see both through the water down to the sandy or rocky bottom of the stream or shallow lake - and, at the same time, we see reflections of the nearby landscape and sky and clouds on the water's surface. The result is a very complex, multi-layered image. Even the way reflected images differ in color and value and shape from their sources needs special attention when you are painting.. Things get even more complicated when the surface of the water is not "flat" but disturbed by moving currents and wind-caused wave action. Then all reflections become even more complex and hard to understand and reproduce on paper or canvas. We'll explore these challenges in this workshop, and work through exercises designed to help you paint more natural-looking stream and lake scenes. Ocean waves and rolling surf are challenging subjects for painters because, like cloud formations, they're always moving. It's hard to identify the shapes of the waves and reproduce the effects of light as it reflects off the ocean's surface, penetrates through wave crests, and causes cast shadows to fall below the crests. Painters have long struggled with painting realistic looking shadows. The problem is often not understanding that shadows are simply areas that the main light source can not directly reach, but that other indirect light sources DO illuminate.. So what color is the shadow of a red barn on a patch of light gray concrete? It absolutely depends on each individual setting - on the color of the sky overhead, and the light reflecting off nearby objects into the shadowed area. A blue sky overhead will cast cool blue light into the barn shadow, tinting the concrete a bluish gray. And if a red or yellow tractor happens to stand near the shadow, the tractor may reflect an intense red or yellow light into the shadow. In this case we may see the concrete tinted a bluish gray in areas and a strong reddish or yellowish gray near the tractor. When you enliven shadows in a landscape with lighting effects like these, the shadows appear truly integrated into the scene, rather than merely colorless, “dark holes” in the ground. Most artists find painting realistic skies and clouds daunting. One difficulty is accurately seeing and rendering the subtle gradations in value and color we see as we scan from overhead to the horizon. Clouds are challenging because they're always in motion. Even in a photograph it can be very difficult to grasp the true structure of a sky layered with a series of overlapping clouds extending to the horizon. A further complication is that clouds must be painted to appear soft and translucent if they're to feel realistic. This workshop presents detailed information on how clouds form and appear as they do, both individually and in formations. We’ll also study how the sun above models the shapes of clouds. And we'll work through a number of hands-on exercises to help you build the skills needed to paint our beautiful Virginia skies. Amateur artists tend to paint flat, one-dimensional trees, whereas a single tree may actually spread out over an enormous area.. An oak tree may stretch 100 feet from branch tips nearest the artist to those opposite on the tree. And like all other features in the landscape, parts of a tree that are closer to your eye are always more sharply defined, brighter in color, stronger in contrast and larger overall than identical objects in the distance. They must be painted that way to appear realistic. In this session we’ll study the structure of bare, leafless trees, and learn to paint them as fully three-dimensional objects, showing the effects of light as it models the shapes of trunk and branches moving through space. In Painting Woodlands Part I we considered the individual trunk and branch structures of trees like oaks, maples, and firs in winter. 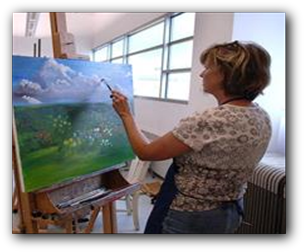 In this workshop, we'll learn to paint the foliage patterns and colors that are particular to those and other trees. Serious painters must learn to paint specific varieties of trees if their landscapes are to appear believable. No more generic “lollipop” trees. We’ll study how the foliage of different trees clothes the branches in ways particular to each species, forming distinctive patterns we can reproduce in paint. We’ll also study how direct and indirect light changes the color of the foliage and practice painting the effects of light penetrating through leaves, making some leaves glow while others on the same tree just show light reflecting off their surfaces. Click HERE to view one of a series of recent newspaper articles about Troy's Art Workshops. Troy Weidenheimer of Lake Monticello, Virginia (near Charlottesville). Six one hour classes at one week intervals, or three, three-hour workshops, introducing beginning, intermediate and advanced techniques, spread over a several month period. In this series we assume participants have basic drawing skills. We'll begin by learning to identify and reproduce in paint the range of light and dark values and graduations one sees on simple geometric objects (cubes, cones and balls) against a plain background illuminated by natural window light. We'll begin by painting in shades of gray to help our focus on painting values. then we'll add one or two additional colors in the following classes. Our goal will be producing dramatically realistic, three-dimensional renderings of simple objects. Even more experienced painters have found this series of classes quite helpful in regaining their appreciation of how light and shadow defines objects, and the importance of painting values accurately in establishing the solidity of the forms. In this series of weekly or daily 90- minute classes, we will assume the participants have basic drawing skills. Well focus on learning to identify and reproduce in paint the range of light and dark values and graduations one sees on simple geometric objects (cubes, cones and balls) against a plain background illuminated by natural window light. In the first four classes we will paint only in shades of gray to help our focus on painting values and then add one or two additional colors in classes five and six. Our goal will be producing dramatically realistic, three-dimensional renderings of these simple objects. Even more experienced painters have found this series of classes quite helpful in regaining their appreciation of how light and shadow define objects, and how critical precise painting of values is in establishing the solidity of the forms. Please email for more informationk. We' always happy to create workshops to meet the special interests of your group. And we're happy to focus each workshop on oil, watercolor or acrylic - or to address all three mediums in each workshop.